"Contributions" redirects here. For other uses, see Contribution. To view contributions to Wikipedia by user, see Special:Contributions. Fundraising or fund-raising (also known as "development") is the process of gathering voluntary contributions of money or other resources, by requesting donations from individuals, businesses, charitable foundations, or governmental agencies (see also crowdfunding). Although fundraising typically refers to efforts to gather money for non-profit organizations, it is sometimes used to refer to the identification and solicitation of investors or other sources of capital for for-profit enterprises. Some examples of charitable organizations include student scholarship merit awards for athletic or academic achievement, humanitarian and ecological concerns, disaster relief, human rights, research, and other social issues. Some of the most substantial fundraising efforts in the United States are conducted by colleges and universities. Commonly the fundraising, or "development" / "advancement," program, makes a distinction between annual fund appeals and major campaigns. Most institutions use professional development officers to conduct superior fundraising appeals for both the entire institution or individual colleges and departments. Examples of this include athletics and libraries. Equally important are fundraising efforts by virtually all recognized religious groups throughout the world. These efforts are organized on a local, national, and global level. Sometimes, such funds will go exclusively toward assisting the basic needs of others, while money may at other times be used only for evangelism or proselytism. Usually, religious organizations mix the two, which can sometimes cause tension. Fundraising also plays a major role in political campaigns. This fact, despite numerous campaign finance reform laws, continues to be a highly controversial topic in American politics. Political action committees (PACs) are the best-known organizations that back candidates and political parties, though others such as 527 groups also have an impact. Some advocacy organizations conduct fundraising for-or-against policy issues in an attempt to influence legislation. While public broadcasters are completely government-funded in much of the world, there are many countries where some funds must come from donations from the public. In the United States less than 15% of local public broadcasting stations' funding comes from the federal government. Pledge drives, a type of annual giving, commonly occur about three times each year, usually lasting one to two weeks each time. Viewership and listenership often decline significantly during funding periods, so special programming may be aired in order to keep regular viewers and listeners interested. Fundraising can come from a variety of sources using a variety methods. These include grants from government agencies, non-profit foundations or corporations; donations from individuals; and sales and services. Income from endowment is not strictly fundraising but rather the fruits of the investment of previous fundraising. Non-profit organizations also raise funds through competing for grant funding. Grants are offered by governmental units and private foundations/charitable trusts to non-profit organizations for the benefit of all parties to the transaction. Charitable giving by corporations is estimated to be $15.29 billion in 2010. This consists of corporate grants as well as matching gift and volunteer grants. 65% of Fortune 500 companies offer employee matching gift programs and 40% offer volunteer grant programs. These are charitable giving programs set up by corporations in which the company matches donations made by employees to eligible nonprofit organizations or provides grants to eligible nonprofit organizations as a way to recognize and promote employee volunteerism. The donor base (often called a file) for higher education includes alumni, parents, friends, private foundations, and corporations. Gifts of appreciated property are important components of such efforts because the tax advantage they confer on the donor encourages larger gifts. The process of soliciting appreciated assets is called planned giving. The classic development program at institutions of higher learning include prospect identification, prospect research and verification of the prospect's viability, cultivation, solicitation, and finally stewardship, the latter being the process of keeping donors informed about how past support has been used. When goods or professional services are donated to an organization rather than cash, this is called an in-kind gift. A number of charities and non-profit organizations are increasingly using the internet as a means to raise funds; this practice is referred to as online fundraising. For example, the NSPCC operates a search engine which generates funds via Pay per click links, and Better The World operates tools allowing funds to be raised via members viewing ethical ads on a browser sidebar and/or blog widget. Save the Children's Dave Hartman wrote after the $1 Million Operation Sharecraft online campaign, "We may have reached our mark, but this is just the beginning of a new era of fundraising and using social media and digital technology to better the world." While fundraising often involves the donation of money as an outright gift, money may also be generated by selling a product of some kind, also known as product fundraising. Girl Scouts of the USA are well known for selling cookies in order to generate funds. It is also common to see on-line impulse sales links to be accompanied by statements that a proportion of proceeds will be directed to a particular charitable foundation. Tax law may require differentiating between the cost of an item versus its gift value, such as a $100.00 per person dinner, for a $25.00 cost meal. Fundraising often involves recognition to the donor, such as naming rights or adding donors to an honor roll or other general recognition. Charity Ad Books are another form of donation for recognition, sponsorship or selling of ads often in an event related program or group directory. Organizations raise funds to support capital projects, endowments, or operating expenses of current programs. Capital fundraising is when fundraising is conducted to raise major sums for a building or endowment, and generally keep such funds separate from operating funds. This is often done over a period of time (in a capital campaign) to encourage donors to give more than they would normally give and tap donors, especially corporations and foundations who would not otherwise give. A capital campaign normally begins with a private phase before launching a public appeal. Many non-profit organizations solicit funds for a financial endowment, which is a sum of money that is invested to generate an annual return. Although endowments may be created when a sizable gift is received from an individual or family, often as directed in a will upon the death of a family member, they more typically are the result of many gifts over time from a variety of sources. A fundraising event (also called a fundraiser) is an event or campaign whose primary purpose is to raise money for a cause, charity or non-profit organization. Fundraisers often benefit charitable, non-profit, religious, or non-governmental organizations, though there are also fundraisers that benefit for-profit companies and individuals. Special events are another method of raising funds. These range from formal dinners to benefit concerts to walkathons. Events are used to increase visibility and support for an organization as well as raising funds. Events can feature activities for the group such as speakers, a dance, an outing or entertainment, to encourage group participation and giving. Events can also include fundraising methods such as a raffle or charity auction. Events often feature notable sponsors or honoree. Events often feature a charity "ad book" as a program guide for the event, but more importantly, as another fundraiser providing members, supporters and vendors to show their support of and to the group at the event by way of placing an ad-like page, 1/2 page, 1/4 page, stating or showing support. Events and their associated fundraisers can be a major source of a group's revenue, visibility and donor relations. One specific type of event is the "ad book" fundraiser, where those who wish to give funds to a fundraising group do so through the sponsorship or statement within a book of advertisements. Online fundraising pages have become very popular for people taking part in activities such as a charity. Those pages facilitate online payments in support of the charity. Popular charity fundraisers in major American cities include lavish black-tie gala benefit dinners that honor celebrities, philanthropists, and business leaders who help to fundraise for the event's goals through solicitations of their social and business connections. Often called donor cultivation, relationship building is the foundation on which most fundraising takes place. Most development strategies divide donors into categories based on annual gifts. For instance, major donors are those that give at the highest level of the organization's fundraising scale and mid-level donors are in the middle. More sophisticated strategies use tools to overlay demographic and other market segmentation data against their database of donors in order to more precisely customize communication and more effectively target resources. Research by Peter Maple in the UK shows that charities generally underinvest in good marketing research spending around a quarter of what an equivalent sized for profit company might spend. Donor relations and stewardship professionals support fundraisers by recognizing and thanking donors, and demonstrating the impact of their donations in a fashion that will cultivate future giving to nonprofit organizations. Recent research by Adrian Sargeant and the Association of Fundraising Professionals' Fundraising Effectiveness Project suggests the sector has a long way to go in improving the quality of donor relations. The sector generally loses 50–60% of its newly acquired donors between their first and second donations and one in three, year on year thereafter. The economics of regular or sustained giving are rather different, but even then organizations routinely lose 30% of their donors from one year to the next. A capital campaign is "an intensive fundraising effort designed to raise a specified sum of money within a defined time period to meet the varied asset-building needs of an organization". Asset-building activities include the construction, renovation or expansion of facilities (for example, a new building), the acquisition or improvement of land, equipment, or other items, and additions to a financial endowment. Two characteristics set capital campaigns apart from other forms of fund-raising activities. First, "the gifts solicited are much larger than those generally sought during an annual fund". Second, "pledges are emphasized as commitments payable over a number of years convenient to the donor or through the transfer of appreciated real or personal property". Various types of capital campaigns have been identified. The traditional "brick and mortar" campaign, focused on building construction or improvements, was considered a "once in a lifetime" campaign in the past because of the ambitious goals of the campaign. Today, however, organizations frequently schedule capital campaigns every five to ten years, and "the megagoals announced by large institutions often are the result of 'counting everything' during a five-to seven-year campaign period". A second type of campaign is the comprehensive, integrated, or total development campaign, which aims for a longer fund-raising program based on a long-term analysis of the organization's needs and direction. This form of campaign can wrap together capital projects, endowment and operating expenses as its purpose, and use a variety of fund-raising activities, such as annual gift drives, which are "slower-paced and lack the intensity of the traditional capital campaign". Some non-profit organizations demonstrate greater accountability by showing donors the direct impact of their fundraising efforts. This accountability usually comes in the form of a vote, where the members select a specific program or charity that they would like their money to go to. A specific example of accountable fundraising is the organization Better The World which allows members to select the charity which receives the money they have raised; members can constantly keep track of the amount raised on the browser sidebar tool. Many non-profit organizations take advantage of the services of professional fundraisers. These fundraisers may be paid for their services either through fees unrelated to the amounts of money to be raised, or by retaining a percentage of raised funds (percentage-based compensation). The latter approach is expressly forbidden under the Code of Ethics of the Association of Fundraising Professionals (AFP), a professional membership body. However, by far the most common practice of American non-profits is to employ a staff person whose main responsibility is fund raising. This person is paid a salary like any other employee, and is usually a part of the top management staff of the organization. Some non-profit organizations nonetheless engage fundraisers who are paid a percentage of the funds they raise. In the United States, this ratio of funds retained to funds passed on to the non-profit is subject to reporting to a number of state's Attorneys General or Secretaries of state. This ratio is highly variable and subject to change over time and place, and it is a point of contention between a segment of the general public and the non-profit organizations. The term "professional fundraiser" is in many cases a legislated term referring to third-party firms whose services are contracted for, whereas "fundraising professionals" or development officers are often individuals or staff at charitable non-profits. Although potentially confusing, the distinction is an important one to note. Fundraising professionals, who have been employed with not-for-profit organizations as fundraisers or as fundraising consultants, for at least sixty (60) months, can become certified as a Certified Fund Raising Executive (CFRE). The CFRE credential is administered by CFRE International, an independent 501(c)6 whose sole mission is dedicated to setting standards in philanthropy through a valid and reliable certification process. A specialty within the fundraising profession is the "grant professional." Grant professionals with at least three years experience, and other requirements, can become certified as Grant Professional Certified (GPC). The GPC credential is administered by Grant Professionals Certification Institute, whose mission is to strengthen the nonprofit sector's ability to pursue and maintain public sector and private sector funding by promoting competency and ethical practices within the field of grantsmanship. The certification process is designed to measure minimum knowledge and skills related to all aspects of grant development and management, including but not limited to such areas as grant research or pre-production, grant construction, grant reporting, public sector funding, private sector funding, ethics and grant accountability. Organizations in the United States established for charitable purposes are allowed to raise funds from many sources. They are given a specific designation by the Internal Revenue Service (IRS), commonly noted as 501(c)(3) organizations. Other nonprofits such as fraternal associations have different IRS designations, and may or may not be eligible to raise funds. Financial information on many nonprofits, including all nonprofits that file annual IRS 990 forms is available from GuideStar. ^ "Very Strong Growth". Huffington Post. Retrieved 2016-10-08. ^ Barnes, C., H. Rice, and I. Sturrock, "On the Offense: Three Athletic Fund-Raisers Tell How They Score." CASE Currents, December 1981, 12-18. ^ "The Most Important Matching Gift Statistics". Doublethedonation.com. Retrieved 2013-12-13. ^ "Alabama Charity Blog". Retrieved April 22, 2010. ^ "World Famous Professional Gamer raises 1 Million for Charity online through FundRazr". Techvibes. Retrieved November 13, 2012. ^ "Events - How to organise an event to raise money/awareness for your organisation". KnowHow NonProfit. Retrieved 16 July 2010. ^ "Bruce Kovner's $5 Million Can't Get Lobster on Menu at Met Gala". Bloomberg News. Retrieved 23 January 2013. ^ Yonker, Larry; McGinty, Chuck; Donaldson, Devlin (June 2002). "The Kingdom Currency" (PDF). Retrieved 2007-06-22. ^ "Useful Past Tips: Marketing". Nonprofit Times. Retrieved 2007-06-22. ^ "Entrepreneur - Start, run and grow your business". Entrepreneur. Retrieved 19 January 2015. ^ Sargeant A. and Jay E. (2004) Building Donor Loyalty, Jossey Bass, San Francisco. ^ a b c Robert Pierpont, "Capital Campaigns" (2002). Center on Philanthropy, Indiana University – Purdue University Indianapolis. ^ ABC News. "Young Professionals Giving Back". ABC News. Retrieved 19 January 2015. ^ "Code of Ethics". Association of Fundraising Professionals. Archived from the original on 2006-12-06. Retrieved 2007-01-23. ^ For example, "Commercial Fundraiser Activity Reports (State of WA)". Retrieved 2012-01-26. ^ "CFRE International – Certified Fund Raising Executive". Cfre.org. Retrieved 2013-12-13. ^ "GPCI". Grantcredential.org. Retrieved 2013-12-13. Scott Cutlip (1965). 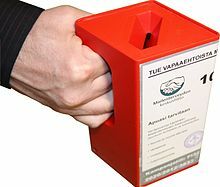 Fundraising in the United States, its role in America's philanthropy. Rutgers University Press.